New York, NY – On Wednesday, April 4, 2012, the German newspaper Süddeutsche Zeitung published Nobel laureate Günter Grass’ poem (the German original) that has created quite a stir not only in Germany, Israel and Iran, but also across the globe. As a result Israeli interior minister Eli Yishai has banned the Nobel laureate from entering Israel. The poem drew much appreciation from those opposing yet another pending war in the region by pointing to the big elephant in the room, but also widespread condemnation by Jewish and non-Jewish groups and public figures in Germany, igniting the irritable Israeli Prime Minister Binyamin Netanyahu, in effect corroborating Günter Grass’ own assessment that his silence so far had to do with the concern that he would be accused of anti-Semitism. He was accused of anti-Semitism. But has the charge of anti-Semitism really silenced the critics of Israel – as Günter Grass suggests in this poem? Not really – or perhaps only so in Germany, for obvious reasons, but certainly not around the globe. The only people who are afraid of being called anti-Semites are the anti-Semites. Yes certain segments of pro-Israeli Zionists, by no means all, hurtle that accusation to silence their opponents. But by no stretch of the imagination has that charge silenced anyone but the anti-Semites – and they better remain silent. In the European and by extension North American birthplace of anti-Semitism, anti-Semitism is either perfectly alive and well, or transformed into Islamophobia, or camouflaged into Evangelical Zionism, or else abused by some Zionists to silence any opposition coming towards Israel – certainly to no avail. To be sure, the condition in Germany is perhaps different – as indeed it should be. 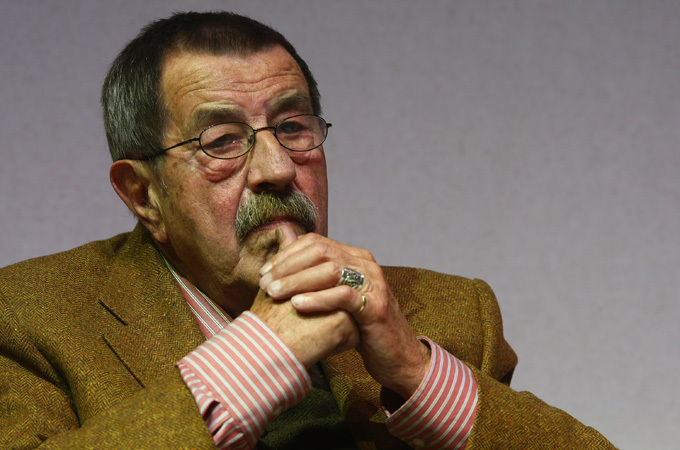 But by overcoming that false fear, Günter Grass can no longer be accused of anti-Semitism – and thus the significance of his poem is not in the straw man he constructs to shoot down (perhaps rhetorically, for after all, we are talking about a poem). It is somewhere else. Setting the dubious fear of being accused of anti-Semitism aside, Günter Grass provides ample reasons – European hypocrisy, German complacency, American barefaced double-standards, Ahmadinejad’s buffoonery and Israeli warmongering – for his poem to assume the global significance that it has. But the importance of the poem is not in stating the obvious – it is in revealing the repressed. Given the history that culminated in the Jewish Holocaust, Jews around the globe, including Israel, have every right to get agitated with a prominent German public intellectual lecturing them about violence. But Zionism is chiefly responsible for having wasted the moral authority of the Jewish Holocaust – through what Norman Finkelstein has aptly called “the Holocaust Industry” – on establishing a racist apartheid state called “Israel” – a colonial settlement as a haven for the victims of a whole history of European anti-Semitism, on the broken back of a people who had nothing to do with that travesty. With a leading German public intellectual openly criticising Israel, pointing to European hypocrisy, and blaming his own country for aiding and abetting in the aggressive militarisation of the Jewish state – a gushing wound is opened that implicates both Europe and the colonial settlement that in more than one sense is its own creation. In two specific terms, both as a haven for the victims of the Jewish Holocaust and as the legacy of European colonialism, Israel reflects back on its European pedigree. It is here that Grass’ poem reveals more than meets the eye. The Zionist project precedes the European Jewish Holocaust -that ghastly crime against humanity following the horrid history of European anti-Semitism expressed and manifested in systematic pogroms over many long and dark centuries. Palestine was colonised by the victims of European anti-Semitism – as a haven against Jewish persecution. That paradox remains at the heart of a Jewish state that cannot forget the truth of its own founding myth. With German atrocities during the Holocaust, Europeans tasted a concentrated dose of the structural violence they had perpetrated upon the world at large. Colonialism and the Holocaust were thus the two sides of the same coin: the aggressive transmutation of defenceless human beings into instruments of power – into disposable “things”. Long before the Jewish Holocaust, the world Europeans had conquered and colonised was the testing ground of that barbaric violence they had termed the “civilising mission of the white man”. European guilt about the Holocaust is absolutely necessary and healthy – it is an ennobling guilt. It makes them better human beings, for them to remember what they did to European Jewry. But, and there is the rub, they are, with a supreme hypocrisy that Günter Grass notes in his poem, spending that guilt (when not redirecting it into Islamophobia) on sustaining a colonial settlement, an extension of their own colonial legacy, in supporting Israeli colonialism in the Arab and Muslim world – as a garrison state that further facilitates their renewed imperial interests in the region. Europeans are turning their legitimate guilt into an illegitimate instrument of their sustained imperial designs on the globe, from whom Americans then take their cues. Israel is a European colonial settlement, the last astonishingly barefaced remnant of European colonialism in a world that calls itself “postcolonial”. The daring imagination of Günter Grass’ poem – a heroically tragic act precisely because the poet is implicated in the moral outrage of his own poem – is significant precisely because it captures this German and by extension European logic/madness of colonial conquest and moral cannibalism. A German intellectual exposing the structural link between Zionism and colonialism marks the even more innate link between the Holocaust and colonialism – precisely at the moment of warning against the regional warmongering of Zionism as the post/colonial extension of European colonialism. What Prime Minister Netanyahu’s reaction to Günter Grass’ poem, and many others like him, do not recognise is that precisely when they accuse the German poet of anti-Semitism they are in fact acknowledging the colonial provenance of the Jewish state. The harder they object to Günter Grass, the clearer becomes the fact that the Jewish state is the rhetorical articulation of the very logic of European global colonialism, of which the Jewish Holocaust, as Aimé Césaire rightly recognised, was a local overdose. BRIC and other countries can do better than complain. They have enough capital to establish a World Bank II of their own. It would also take some load off from World Bank I. In WBII they can have their own democratic system of selecting a president. Suranjit finally admitted his failure in the national scandal that rocked the boat for AL. His resignation was long overdue as he engraved his name in gold letters amongst the honor list of “corrupted-and-disgraced” political leaders of our time. On Titanic’s anniversary we should be asking ourselves one question. Was Sunranjit the tip of the iceberg? How many more Suranjits exist in different ministeries. Just because he got caught does not mean others are innocent. How will we know the true extent of their corruption? Taka 7 million a night, per night, per month, per year, where does it stop? is there anyone left in this country who will do his work honestly? Indeed, the iceberg below is a massive rock with the potential to sink any boat that crashes into it. Boats will keep sinking as long as we choose to remain blind about our reality. The reality is that we got a bunch of greedy, corrupt, unethical, immoral, dishonest, incompetent people holding the highest offices of the state. Their roles as criminals are hidden behind blankets of western degrees and deceptive pedigrees. They are just plain old thieves. How long is it going to take us to realize this? Suranjit resigns taking blame | Bangladesh | bdnews24.com. Hey, this is the place to make EZ money, quick money, white money, black money, any kind of money, you name it, they got it. They have it all. You can bribe your way out of anything. You can also bribe your way into any deal. Ofcourse you must have the right connections. Its a country where journalist couples were murdered in front of their 5 year old child. 48 hours deadline given by the government passed into 48 days without any signs of progress in the case. Its not very difficult to imagine what will happen to a petty 7 million taka mystery involving the personal secretary of a minister. Its not as much as a rounding error in the greater scheme of things. Its a country where rulers swear by the sacred verse “shoot the messenger” repeatedly. You are allowed to do anything you want, as long as its not against the government. Hell, if you speak up against corruption, you would risk kissing good bye to your life. Suranjit washes hands off ‘Tk 7mn mystery’ | Politics | bdnews24.com.